Guatemala is in upheaval today. In the past few days, prosecutors for the country’s Public Ministry charged President Otto Pérez Molina with “being part of a criminal organization, with the purpose of defrauding the state.” He joins his once-vice president Roxana Baldetti in jail, with Baldetti and dozens more officials implicated in the corruption scheme known as La Línea, a conspiracy that funneled state money into private hands. The story that cannot be lost in the proliferation of spectacular images, such as that of Molina listening to the charges against him this morning, is what led to the events of the past week: people organizing to oust a corrupt regime and rebuild a sense of collective agency in a country decimated by a civil war that raged for thirty years. The war left an estimated 200,000 dead or disappeared, the latter being the term used to refer to the people who vanished without a trace, never to be heard from again, and it is the impact of these horrors, too, that current organizers are struggling against. Speaking with people in the country in the month leading up to Molina’s resignation, the constant reference point of conversation was the period at which the civil war reached a fever pitch: 1979-1983, with a year or two of variation depending on where in the country the speaker was living during that time. “The fear cannot be described,” one man told me about that era. We were on a bus, and as often happened, after striking up a conversation and navigating ‘safe’ subjects for the better part of an hour, I began picking up on his subtle references to political developments in the country. Once we broke through to direct political conversation, he spoke to me of his ambivalence about having escaped the country rather than taken up arms during the war. The guerrilla struggle, while ultimately unsuccessful in the face of a US-backed Guatemalan military utilizing a genocidal scorched-earth policy, enjoyed broad-based support from the rural population of the country, a demographic that continues to constitute the majority of the country’s people. While my friend on the bus left the capital to flee to the United States rather than to the mountains during the conflict, this was a fluke, an opportunity to which the overwhelming majority of the Guatemalan population lacked access. The fear born in this period, with friends and family disappeared without a trace, or buses regularly searched by Kaibiles, special military ‘death squads’ tasked by then-president Efrain Rios Montt with “exterminating” guerrilla support in the countryside and communists in the cities, continues to weigh heavily in contemporary Guatemala. Many of the ex-guerrillas I spoke with felt that the current anti-corruption movement’s base among youth was an important strength. “They do not know what it was like, they can only have heard stories about the war,” said one ex-URNG (Unidad Revolucionaria Nacional Guatemalteca) fighter in Quetzaltenango, a Mayan-majority city in the southwest of the country. Fighters from this portion of the country were largely affiliated with the URNG, which after the violence formally ‘ended’ in 1996, became the broader umbrella for the united front of guerrilla groups during the peace accords negotiation process. Today, the URNG has transformed itself into a political party, albeit, a small one that in this coming election cycle has teamed up with WINAQ, a left indigenous party, to put forth a presidential candidate. That those on the front lines of this summer’s protests didn’t live through the violence undertaken by the Guatemalan state in the name of anticommunism has likely facilitated their bold denunciations of those in power. I witnessed university students in Quetzaltenango dump dozens of stolen election campaign signs from the leading political parties in front of the entrance to the city’s municipal building, blockading anyone from entering or exiting the building, and finally setting off firecrackers on the pile and all around it, brazen political theater that once would have been more than enough reason for those students to be kidnapped by the state. However, these students punctuated their actions with laughter and singing, posing for photos, albeit with masks covering their faces, before jumping in a truck to leave the scene. While the overwhelming demand of the current protests is an end to corruption, one that pressured the (corrupt in their own right) Guatemalan judicial institutions to charge Molina along with many of his colleagues, what remains to be seen is whether this demand broadens into a call for justice. Rather than centered on La Línea, this is a historically-informed justice that begins with the rural and indigenous populations who continue to suffer the consequences of (genocidal, in the case of the Ixil triangle) massacres as well as land dispossession in the interests of export-production, from coffee to more recent investments in African palm and hydro-power. While Cacif, an organization representing the interests of a number of big business sectors, has supported the anti-corruption protests in the past week or so, this broader demand would likely break this cross-class coalition, with Guatemala’s oligarchic handful of wealthy families forced to account for their role in the dispossession of the wider, deeply-impoverished, population. As Allan Nairn explained on Democracy Now, this shift in the uprising’s demands is one that makes intuitive sense, as the history of Guatemala’s civil war and land reforms can’t be considered distinctly from the present: President Molina, under the alias ‘Commander Tito’ during the war, commanded operations that resulted in scorched earth massacres of the rural population. Caught on remarkable and horrifying film standing near civilian bodies during the conflict, Molina is a military man through-and-through, trained at the infamous United States School of the Americas along with a number of his ex-military colleagues in Congress today. “But this time everything turns out differently. The policeman shouts, but the man doesn’t run. He just stands there, looking at the policeman. It’s a cautious look, still tinged with fear, but at the same time tough and insolent. So that’s the way it is! The man on the edge of the crowd is looking insolently at uniformed authority. He doesn’t budge. He glances around and sees the same look on other faces. Like his, their faces are watchful, still a bit fearful, but already firm and unrelenting. Nobody runs though the policeman has gone on shouting; at last he stops. There is a moment of silence. This is what’s now taking place in Guatemala. Whatever may come next, the effect of a fear dissipated on the future of a people cannot be underestimated, nor its outcome predicted in advance. Before leaving for Guatemala, I watched “When the Mountains Tremble,” a documentary made in Guatemala in 1982, at the height of the country’s civil war. It has incredible footage of guerrillas, the pueblos that supported them, and soldiers committing mass killings that have now been legally classified as genocide. I recently watched the follow-up film, “Granito de Arana,” made by the same director. It’s on how she captured such rare footage and how that footage is aiding in prosecuting those responsible for killing 200,000 people during the war. The most critical figure in this is Efrain Rios Montt. I recommend both films (at least the first of which is available online). Both share a focus on Montt, and since coming here, it’s become clear that the role Montt plays in many Guatemalans’ thinking about he country is greater than I’d understood. When he’s mentioned, rather than saying “may god bless his soul” as one might after uttering a saint or martyr’s name, the speaker often adds “may god strike him down as I speak.” While this is said with a laugh, it’s clearly no joke. Montt commanded the military during the years of its worst massacres, continuing to hold political power on and off until 2012. During his time at the head of the state, he employed a number of policies that contributed to what was in effect a genocide for the predominately indigenous countryside population. The first of these was a tierra arasada, or scorched earth, policy. As in US counter-insurgency campaigns (and perhaps not coincidentally since the US and Montt’s regime worked hand-in-hand), tierra arasada was justified with reference to a Mao quote, that “as water is to the fish, the people are to the guerrillas.” According to Montt’s second-in-command, this implied the need to decimate “the people,” as without people, the guerrillas cannot survive. Without debating why right-wingers were quoting Mao, it’s a policy worth highlighting considering the ongoing genocide trial against Montt and his lower-level commanders. The final policy, the obverse of these rural policies, were the feuros especiales. These were black-site special courts that processed and sentenced to death those who became (and remain) known as “the disappeared.” Totaling over 45,000 people, the disappeared were overwhelmingly urban activists: leftists, students, professors, and union members. As implied by the above photo of my friend’s drawing , the judges of these courts hid their faces with bandannas (with the drawing’s unintended evocation of the KKK not far off the mark). While Montt later explained this practice as coming from the judges’ fear of retribution from guerrillas should they be identified, it’s widely speculated that it was necessitated by the fact that these were not judges at all, but rather, military officers. Whether what Montt’s military forces did was genocide against the indigenous or indiscriminate slaughter of all rural residents (a political and legal, rather than moral, distinction) remains subject to debate. However, it’s clear when talking with people here that the result, wiping out entire indigenous regions, speaks for itself. I came here thinking the focus on Montt’s conviction in a criminal court was somewhat misguided, but realized that not only is the conviction symbolically important, but it also paves the way to try other past military leaders, many of whom remain in power, including the current president, Otto Perez Molina. Many Guatemalans have been trying to have Montt found culpable for war crimes for nearly two decades (and while he was recently found guilty, the ruling was thrown out soon after). Despite these efforts, he remains free. It’s unreal to hear Mayan people who lived through these massacres, K’iche’ and Mam alike, speak about Montt today. When discussing Montt with a friend a few days ago, I mentioned that the only way I could convey the role Montt plays here is by imagining how Hitler would we be spoken of in Germany had he remained alive. When discussing Montt with someone today, they made this reference themselves by simply calling Montt ‘Hitler’ throughout our entire conversation. I’ll end with an anecdote, told to me by a K’iche’ ex-guerrilla whose main work during the war was with la Voz Popular, the guerrillas’ radio station that broadcast military and political developments to the Guatemalan public. He spent nine years with the unenviable job of biking supplies at night across the volcanic range in which Voz Popular‘s clandestine outposts were scattered. After the war, he continued to work on alternative communications structures, and in 2000, presented a proposal on the subject to Congress. With 2,000 supporters there to witness his organization’s presentation, he stepped up to the podium to help give the proposal to the then-president of Congress, none other than Rios Montt. Having relayed this, he laughed the story off with another “may god strike him down as I speak,” and moved on to discuss his current work. As I talk with more people and Montt’s ongoing stalled trial continues to come up, it’s clear that in contexts like that of post-war Guatemala, a focus on the individual can broach the social silence of a country and open the floodgates to broader structural discussions. *An international commission investigating the massacres after the war found that 93 percent of these massacres and violations were commuted by state forces, 3 percent by guerrillas, with the final 4 percent unable to be determined. Video of cops throwing bricks thrown by protesters back at them, launching tear gas at high school students, beating photographers, and shooting bystanders with rubber bullets: all this is going on in Baltimore right now in the aftermath of Freddie Gray’s murder by the Baltimore Police Department. All this makes today a day to bear in mind that it was inner-city rebellions (rebellions, not riots) in the 1960s that gave much of the world a view into the unbearable conditions in which the black population in this country exists. The result was incomplete and partial progress, but progress that would not have happened had it not been for communities acting back against their oppression. By refusing to acknowledge the authority of the state as embodied in its coercive forces, and making themselves ungovernable, these communities unmasked the reality that it is the people, not those in power, who decide when political change will happen. At times this must take the form of an absolute break with previous reality, even if this means violence. As anti-colonial theorist Frantz Fanon once wrote, “from birth it is clear to [the oppressed] that this narrow world, strewn with prohibitions, can only be called in question by absolute violence.” He goes on to specify that rather than initiated by the oppressed, violence is a learned practice, etched deep into oppressed psyches by their experience of the violence of white supremacy. As Fanon writes, white supremacy “is violence in its natural state, and it will only yield when confronted with greater violence.” While we who participate in extra-institutional or street politics can criticize violence as strategic error, and I don’t think we can rely on violence to defeat what amounts to nearly infinite instruments of violence held by the US state (and in truth, no one I know in these movements is naive enough to believe we can win by violence alone), condemnations of political violence as immoral can only be directed at the violence of the state if we want our critiques are to maintain logical consistency. And yes, the targeting of police, corporate chains, and payday loan stores is by all means a political choice. Dilapidated housing, bad schools, police brutality, and a lack of jobs for urban communities went from the periphery to the center of US political priorities in the wake of the 1960s rebellions. The US government poured billions more dollars into housing in an attempt to regain its footing over the cities. A pillar of their multi-pronged strategy, it was the Black Panthers’ free breakfast program that so threatened the state that the government institutionalized the idea, severing any mention of where the program came from but revealing the tenuousness of state legitimacy against the Panthers in the process. In Watts, even a former CIA director, John McCone, in his state-funded McCone Commission, found the cause of that city’s 1965 rebellion to be ” high unemployment, poor schools, and other inferior living conditions for African Americans in Watts.” Similar reports with similar findings were filed for many other U.S. cities. Freddie Gray, and hundreds of black men, women, and LGBTQ individuals die senseless deaths in this country each year at the hands of the police. Being black in the United States is a game of Russian roulette with the forces that occupy black communities (not to mention the Zimmermanite vigilantes who emulate them). Black youth are forced to be conscious of their mortality in a way I, as a white kid, never was. 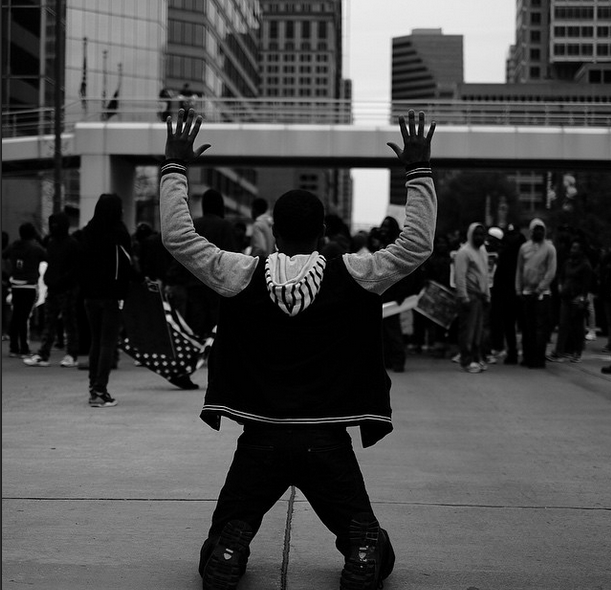 It is in this context that youth in Baltimore are fighting for their freedom and humanity. It’s important to support them in that – be it through sending bail money or amplifying their voices – and to turn your eyes to your city at the end of the day. While you might have to squint real hard to find them, as no one with power voluntarily acknowledges their existence, there are youth in your own backyard trying to achieve freedom too, and now’s the time to offer your support to them in whatever way you can. Not rhetorically, I mean, take on some of the risk which is currently overwhelmingly hanging over the black population every day. If they win, we all win, as the only people who benefit from the perpetuation of a white supremacist capitalist system are those at the very top. The police are one key instrument in the reproduction of that system, birthed into existence as slave catchers and forces for disciplining the poor, so to diminish their power – or disband them entirely- is to make progress. Do you have cash? Graphic design skills? A car? A law degree? A public platform? All that, that’s what you offer up. And if you read this far, I know at the least you’ve got free time to offer.